Somatic copy number variations, or CNVs, are frequent occurrences in the tumor landscape and the detection of these events remains a challenge. Whole-genome sequencing is well suited for detection of CNVs but is not always an option, especially in the clinical setting where whole exome and targeted panels are both faster and more cost effective. FACETS is a recently released tool that supports CNV identification in both targeted panels and whole exome data. 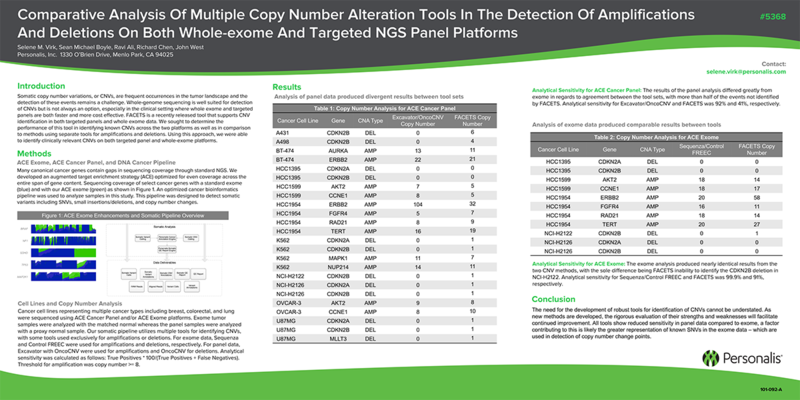 We sought to determine the performance of this tool in identifying known CNVs across the two platforms as well as in comparison to methods using separate tools for amplifications and deletions. Using this approach, we were able to identify clinically relevant CNVs on both targeted panel and whole-exome platforms.